This morning, I stumbled across a strange scenario when preparing a big image-only mailshot for a client. After sending him the proof as normal he instantly replied: “Why is the image clipping in Outlook?”. As it turns out, email clients that use the Word 2007 rendering engine (ie. 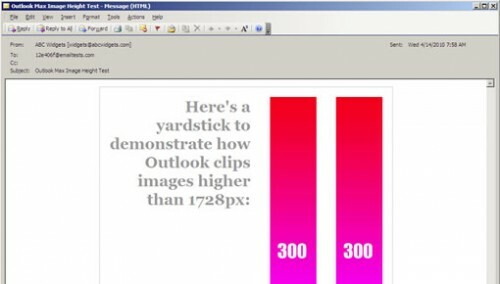 Outlook 2007 and Outlook 2010) have inherited the Word 2007 image height limit of 18 inches. 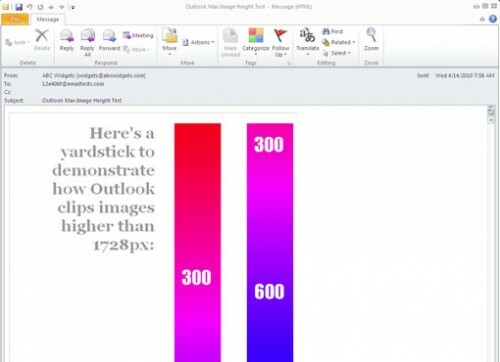 You may be wondering, “Who adds images larger than 1728px high to their emails?” Well, sometimes it happens (images says more than a 1000 words and so on)… So before you warm up your scrollbar, don’t forget that Outlook has its limits.